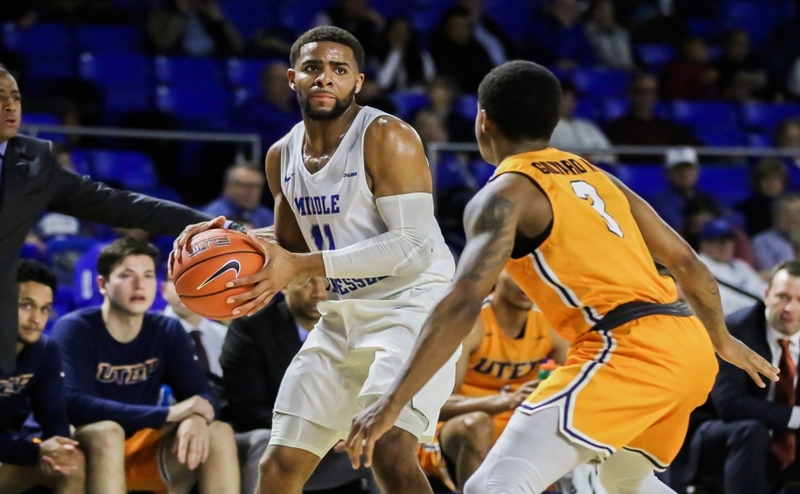 The Murphy Center was full of three-point jump shots, dunks, dance moves, excitement and enthusiasm on Thursday night, as the men’s and women’s basketball teams had their first public showing in front of the Middle Tennessee faithful. Comedian and Middle Tennessee State University alumnus T.C. 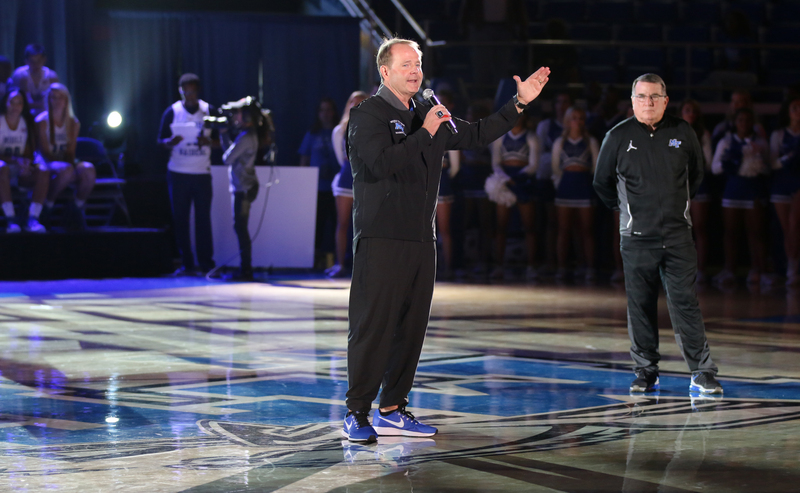 Cope was the master of ceremonies for the night’s events that included a skills competition, shooting stars challenge, a three point shootout and a dunk contest. The players for both the men’s and women’s teams were split up into four co-ed teams that were coached by MT basketball alumni. 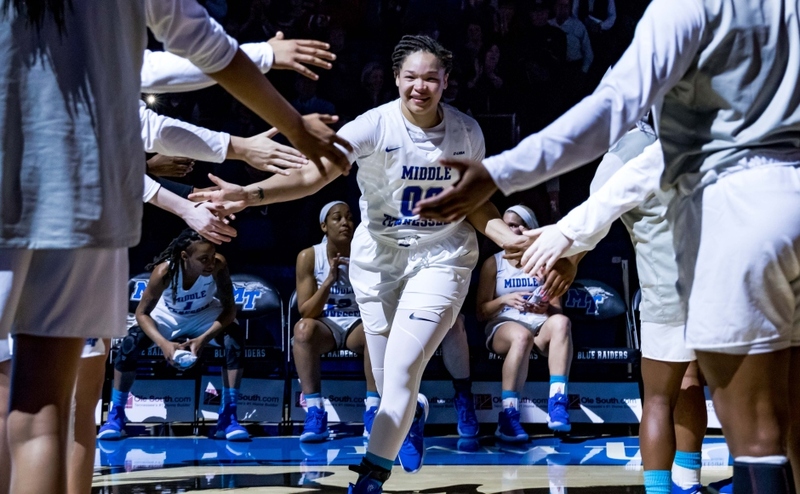 Before the night’s festivities went underway, the main lights went out and the spotlight was turned on as both teams had their individual player introductions that involved loud cheers from the Murphy Center crowd and the players displaying their personalities and dancing ability. Hall of Fame women’s coach Rick Insell and men’s coach Kermit Davis also received loud ovations as they were both introduced. The fun continued as the skills competition began. Being the first event of the night is a hard thing to do because you need to get the crowd going. 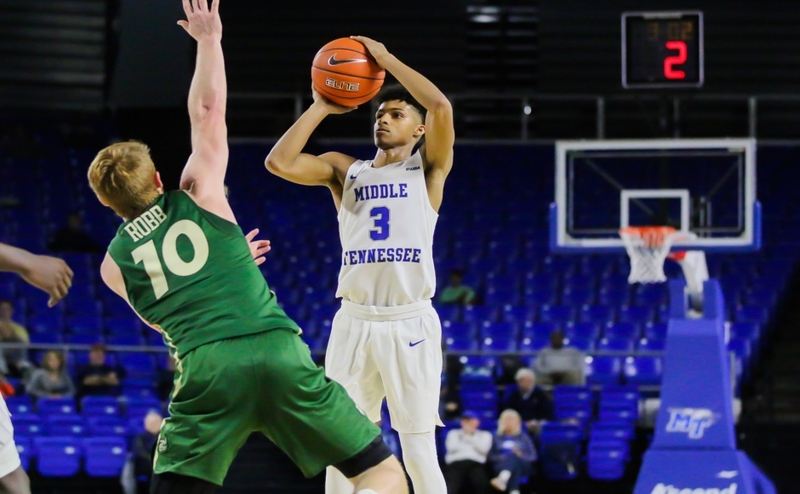 Sophomore Tyrik Dixon showed out with his ball-handling skills for Team Boogie and Zeynep Canbaz also showed out for Team Laken. She showed that she is going to be a force on this team this year with her ball-handling skills and shooting style. The skills competition was followed up by the three point shoot-out. During the three point shootout, Senior guard Giddy Potts had the most notable performance as he drained 18 of his 25 attempts for Team Laken, including a stretch of seven consecutive made three point buckets. 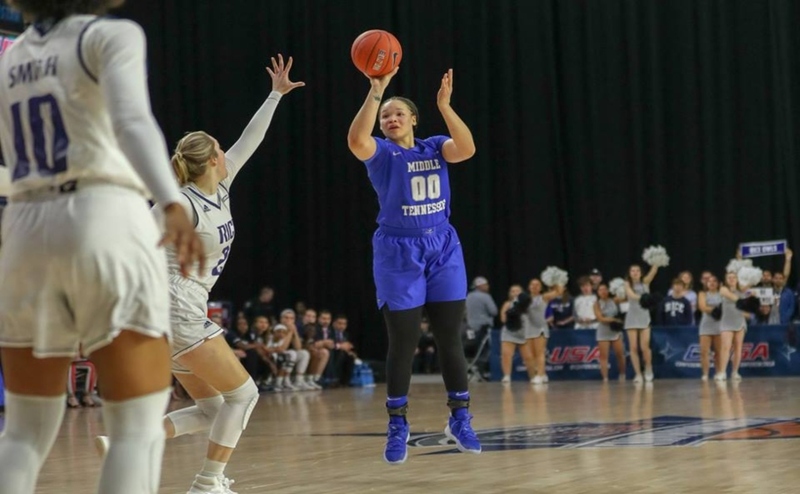 On the women’s side of the floor, Senior shooting guard Abbey Sissom got hot and shot the lights out as she led team Boogie to get a little bit closer to Team Jaqwan who lead the event by at least eight going into the shooting stars competition. The shooting stars competition followed and it featured an unlikely hero in Will Slatten. The event consisted of each team making a layup, a 18-foot jump shot, a free throw, a three-pointer and a half-court shot in order to win the competition. Team J.J. won the challenge as men’s team Slatten knocked down a half-court heave at the buzzer to put his team within two points of Team Jaqwan going into the finals of the nights final event, the dunk contest. In the crowd’s favorite event of the night, Antwain Johnson took on Davion Thomas, with Johnson moving on after throwing down a two-handed, wind-mill dunk. The second match up of the night pitted David Simmons against James Hawthorne. Hawthorne couldn’t finished his dunk, but got a chance to do a 360 slam while Simmons impressed everyone with an off-the-backboard wind-mill dunk. The final matchup was between the guards, as they each reached into their bag of tricks for a victory. They both did two dunks. Johnson did a another two-handed wind-mil slam, while Simmons bounced a pass to himself for a scintillating slam. The winning dunk was a two-handed, reverse wind-mill by Johnson, giving him his second win in as many years in the Murphy Madness dunk contest. The dunk contest victory gave Team Jaqawn the victory for the night. Overall, Murphy Madness turned out to be as entertaining as advertised and excitement for the basketball season is reaching a fever pitch. The women’s team starts off the season with an exhibition showdown against Tennessee Wesleyan at 3 p.m. at the Murphy Center. The men’s team will tip-off the season on Thursday November 2nd as they host Arkansas Fort Smith for an exhibition game starting at 7:30 p.m.